Achieving your ideal body is about more than just hitting the gym regularly, there’s an entire biological science that goes into meeting your body’s energy needs in order to get the outcome you want. If you’re not seeing the muscle gain results you expected, there is a simple way to kick your body into high gear and get the most out of your workout. Make sure you are getting enough calories to support the activity. If you aren’t feeding your body what it needs it will be using the foods you do eat for energy, not building muscles. And if you are on a calorie restrictive diet, it may even be using muscle tissue. Why Use a Mass Gainer? 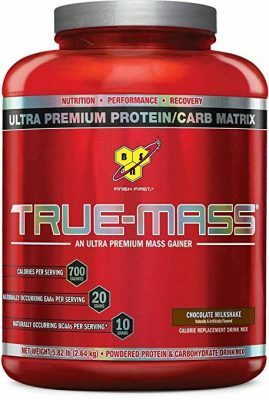 If you haven’t seen the results you’ve been looking for or you are having difficulty meeting your daily calorie needs, you might want to consider using a reliable mass gainer. This will help you get all the nutrition you need to start gaining weight and packing on muscle without having to shovel food in your face and feeling bloated all day. Increased Muscle Mass: Resistance training can induce muscle growth, but if you don’t take in the proper nutrients, you can’t expect to see results. Research studies have consistently shown that whey protein is more effective than other protein sources when it comes to promoting increases in muscle size and speeding up recovery from workout sessions. Hence, it would be great if you can find a mass gainer with a high concentration of whey. Increased Muscle Strength: Although some supplement manufacturers are making claims that seem impossible to achieve, researchers revealed that mass gainers can really enhance muscle strength. Creatine supplementation, in particular, has been cited as capable of increasing your strength when combined with resistance training. Improved Blood Circulation: Mass gainers typically contain the amino acid arginine which aids in the synthesis of nitric oxide, which, in turn, helps improve blood flow to working muscles. This facilitates nutrient delivery and enhanced performance during exercise. The increased blood flow also facilitates the removal of waste products that cause muscle pain and soreness. Increased Fat Burning: Majority of mass gainers contain branched-chain amino acids (BCAAs). Amino acids are the building blocks of proteins and are used to build muscle. Multiple studies have shown that the use of supplements can increase fat burning during workout or training sessions. Perhaps the best thing about using a mass gainer is that you can get everything you need in one simple shake. This makes for the perfect post-workout meal because after a workout your body is depleted of glycogen and glucose and will use the carbs in your shake to replenish them while using the protein to build muscle. Without carbs and other nutrients, your body will end up using protein for fuel, rather than repairing muscle tissue. There are a few key factors you need to consider to help you select the right weight gainer that will work for you. If you are bodybuilding already. you know how hard it can be to meet your daily calorie requirements simply by eating. Weight gainers are an excellent alternative to eating day and night in order to reach your goals. Weight gainers often come in different varieties for different calorie needs. If you only need a little help to substitute a fatty protein, or if you need a lot of help to put on lean weight you can choose the weight level gainer that is right for your needs. In a regular diet, creatine requires carbohydrates in order to transform into creatine phosphate in your body. This is important for generating enough energy to push your body to its absolute limits. Mass gainers allow you to kill two birds with one stone by adding the creatine and the carbohydrates necessary to break it down into one simple solution. You may be noticing a theme here so far. Mass gainers are an easy way to get everything you need without having to stock up at the grocery store. And lean fats are no exceptions. You need fat in your diet to break down nutrients and proteins, but problems often arise when you eat the wrong fats. Mass gainers make getting the right ones easy, so you can put on weight without increasing your BMI. GNC’s Pro Performance AMP is a lower calorie (as far as weight gainers go) combination of protein and carbs. I believe these gainers are ideal for beginners, who may not understand their calorie needs and don’t wish to overshoot them. It is also a good gainer for those with lower calorie requirements. With fewer flavor options than some of the other gainers on the list, GNC’s AMP still gives you all the basics you will need in your battle to gain lean muscle. The combination of whey and soy is a good balance between proteins that get absorbed into your body quickly and those that don’t for a double whammy of protein. The calorie count is lower than some of the other gainers out there, so you can use it more frequently without worrying about overshooting your macro goals. This is a great entry level gainer for weightlifters that are new to mass gainers. If you are not so sure about whether or not you will need an addition two-thousand calories every day alongside your healthy diet then this gainer might be a good place to start. The combination of protein and carbs will give your body what you need in order to gain weight and build muscle. The two types of proteins selected for this gainer work very well together, as one can break down in the body very quickly while the other takes a little more time. Basically, this means that if you take this right after your workout your body will be fueled up for several hours, which is ideal for fast recovery of your muscles. This wouldn’t be considered a disadvantage to everyone, but the ingredient list is pretty short on this one. Though the two proteins chosen for this formula work well together, there are plenty of other options out there. There are also many allergies and sensitivities that come with soy (plus the much-debated phytoestrogen issue). Though I would reiterate the intended purpose of using these specific proteins together is to prolong the release of protein in your system, not to be hypoallergenic. Also, this one is a little low on calories in comparison to the rest of the market. This makes it good for a beginner who might not have a huge caloric need, but a more serious bodybuilder may find this light on mass. Instead of relying on just one type of protein for energy, this powder has a full spectrum of proteins, giving you the best of what each type has to offer. Clean Gainer contains whey isolate, milk isolate, whey concentrate, and micellar casein protein, giving you a total of 30 grams of protein per serving. This boost of protein, combined with the boost of carbs it also provides, fuels your body and allows you to power through intense workouts. High Quality Calories: Like any good weight gain supplement, this Clean Gainer is pretty calorically dense, with 560 calories per serving. However, unlike other weight gain supplements, Clean Gainer doesn’t have a ton of empty, non-nutritious calories. All 560 calories are high quality energy for your body, not just cheap energy from sugar. In fact, there are only 8 grams of sugar in each serving. Most of the calories in this powder come from the proteins and carbs. Clean Gainer has a complex carb blend from 8 different sources, including organic quinoa, blueberry powder, organic rice bran, and oat fiber. Some of its calories, about 60, come from fat, but only high quality, essential sources of fat, such as flaxseed, avocado, and sunflower. BCAA Rich: Each serving of Clean Gainer is rich in BCAAs, including L-Leucine, L-Isoleucine, and L-Valine. BCAAs can boost your workout even further, since they are known to decrease muscle fatigue and increase muscle growth. BCAAs also help speed up recovery time between tough workouts, decreasing muscle soreness, and they make sure your muscles are being used as efficiently as possible. Clean Gainer provides your body with the nutrition it needs to pack on mass and muscle. That being said, it will only work as well as you make it work. Just taking Clean Gainer and doing nothing else likely won’t get you the results you want unless you’re just looking to gain weight without any muscle definition. 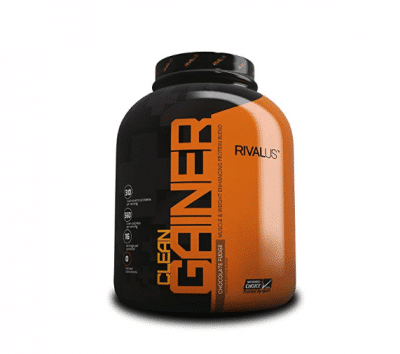 Clean Gainer is perfect for anyone who is looking to bulk up, is willing to do the work, and just needs a little boost. BSN’s TRUE-MASS takes on mass gainers with an impressive six sources of protein. This gainer is a little light on the calorie count, though that can be a good thing depending on your specific calorie needs. Not everyone’s metabolism works the same, and some bodybuilders don’t need quite as high an intake as others. If you don’t have as high a metabolism as others or if you aren’t looking to put on quite as much weight this is a good option due to its lower calorie count. It also comes in a smaller container as well, in case you don’t plan on using it multiple times a day. 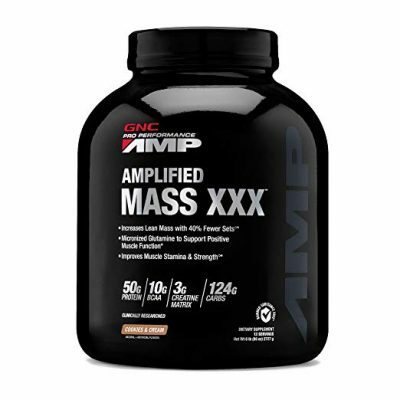 This type of mass gainer is ideal for those looking to gain the leanest mass possible. It is packed with all the nutrients you need in order to build mass, just is somewhat smaller quantities. This is good for putting on weight, but not so much weight that you might end up with fat or have your muscles get too bulky. If you are an all-around athlete and not just a bodybuilder this gainer will help you put on the lean muscle definition that would be otherwise harder to achieve. 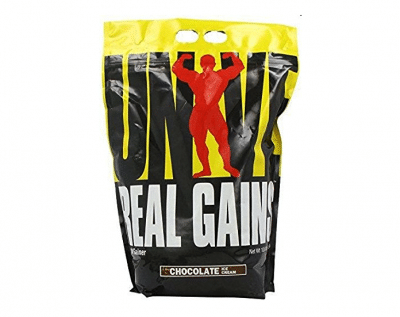 Personally, I think this gainer is best for beginners who are uncertain what their calorie needs will be or those who don’t yet know which protein works best for them. Though not everyone will agree with this, my favorite thing about this gainer is its low-calorie count which makes it easy for your body to get the energy it needs and the nutrients to build muscle without overshooting your goals. Though it may seem a little on the low side the ninety grams of carbs and forty-five grams of protein in each serving is just enough to give you a two-to-one ratio of protein to fuel for energy. Additionally, it has the highest number of protein sources on this list, so would most benefit those who need a wide variety of protein sources or those who are unsure as to which ones will work best for them. When it comes to the downsides of this gainer there are a few. For one there are a lot of allergens in this gainer, including whey (which is in nearly all of them, so I can’t really judge that too harshly), egg, and wheat (for maltodextrin). Since it contains wheat it also contains gluten, which won’t work for anyone with a sensitivity. This won’t be an issue for most people, but it is something you should keep in mind. Additionally, if you are looking to put on a lot of weight in a short period of time, or have a particularly strenuous workout, this gainer is unlikely to have enough calories for you to reach your goals. Personally, I would say that this gainer is better used by beginners who might not have a set regimen yet or those who are unfamiliar with how many calories they will need every day to reach to body goals they have set for themselves. 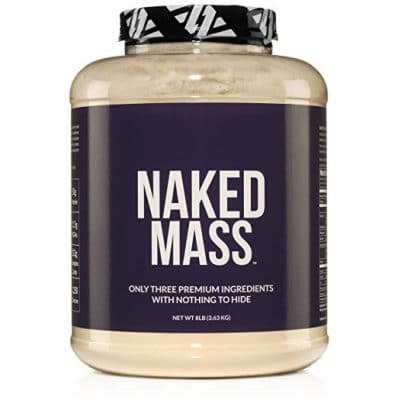 As the name might suggest this mass gainer is a serious contender and a heavy hitter in the calorie department. 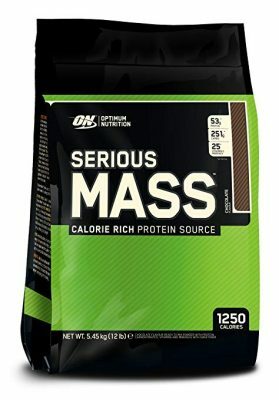 With a hefty 1,250 calories per serving and 50g of protein, the Optimum Nutrition Serious Mass Gainer is a great option to consider if you are looking to bulk up fast. It combines three different protein sources to ensure you are getting the nutrients from the places you need. Whey is the industry standard, but egg and casein are also excellent sources that can provide sustained release and a full amino profile. It also includes 250g of carbs per serving, mostly from maltodextrin. This combined with the twenty-five essential vitamins should make it simple for your body to feed off of the nutrients you are giving it in order to transform those calories into pure lean muscle. It comes in a twelve-pound bag to keep you from frequent trips to the store too. One major benefit this gainer has to offer is the variation in protein sources. Not everyone’s body breaks down protein (or any other food for that matter) in the same way, and some people have more difficulty breaking down proteins from particular sources more than others. So, having a gainer with three different type of protein will help ensure you are getting what your body and your muscles need. The whey digests very quickly, the egg slightly slower, and casein the slowest, ensuring you’re getting a constant stream of aminos for several hours after you drink this gainer. Optimum Nutrition also offers a variety of flavors for you to choose from, so you don’t need to worry about having to flavor it yourself with fruits and a blender or try to force yourself to drink some flavorless powder. These shakes taste great, which makes it easier for you to simply throw this in your shaker bottle and be on the go. If you have an egg sensitivity you may want to look elsewhere. Though it is a great benefit to have several protein sources in your gainer it can be a drawback for anyone who has allergies. This gainer also contains artificial flavors and sweeteners as well. Having a flavored gainer can certainly make it an easier pill to swallow, so to speak, but it can be a deal breaker for those who are very conscious of what they put in their body (if artifical sweeteners are a hard stop for you, the next on the list will fit your bill). I’m also not a huge fan of maltodextrin and am inclined to believe it is from a wheat source, as that is the most common to be found in gainers. This means it would contain gluten and not be suitable for people with celiac disease. However, if you don’t have any of these issues then the flavor could definitely be an incentive rather than a drawback. This powder can help you pack on the pounds since it’s dense in both carbs and proteins. One serving has 53 grams of protein, which makes up a significant portion of your daily needs, and an impressive 84 grams of carbs. The proteins and carbs are well balanced to be both slow and fast digesting, meaning it can give you quick energy for your muscles but also help support long-term muscle growth. With 602 calories per serving, this powder contains almost one third of the calories a person on a normal 2,000 calorie diet would eat in a day, and over 100% of the protein they would eat. Of course, when you’re trying to gain mass you need a surplus of calories, and it’s a good idea to get them from a healthy source instead of fro junk food. Getting your extra calories from junk food will make it harder to turn those calories into muscle gains. Easily Digestible: Consuming large amounts of protein at once has been known to cause some digestive discomfort, which can be enough to completely turn you off a product sometimes. However, Universal Nutrition combats this by adding inulin and 5 grams of fiber to each serving. Five grams doesn’t sound like a lot, but it’s actually almost 20% of your daily fiber needs and does wonders to counteract the effects of that much protein. Good Source of Healthy Fats: Real Gains is a nutritionally well rounded shake, with a small portion of healthy fats in every serving, on top of all the protein, carbs, vitamins, and minerals it already has. The fats in this shake come from MCTs and EFAs, both of which are essential to many of the body’s functions. Seamlessly mixes into water, milk, juice, etc. This gainer has only 3 ingredients and packs a big protein punch. It works great as a meal replacement without having to worry about all the artificial stuff that usually comes with gainers like aspartame, artificial flavors, and GMOs. This gainer isn’t flavored at all, it contains no soy, and it has only 5g of sugar. If you are beginning to wonder what this gainer DOES have, I can tell you; a lot of protein, BCAAs, and a high-calorie count per serving plus all the essential vitamins you need. It also comes in an eight-pound container, so you know you won’t have to be running to the store or going online to get more every other week. Obviously first on the list is the lack of artificial additives that you see in almost all other gainers, and let’s be honest, the supplement world as a whole. Now, not everyone is into the all-natural thing but you don’t really have to be in order to appreciate the lack of fake flavoring or the potential health risks of certain sweeteners. Granted, if you wanted the “all natural” approach you could try just eating whole foods, but we don’t all have the time (or money) to cook healthy meals multiple times every day. Another thing I want to add about this gainer that makes it a little special is that the maltodextrin it contains comes from tapioca and not wheat (as is common), meaning it is actually gluten-free as well. This is hands down the best option for those with special dietary restrictions like celiac disease, hypoglycemia, or even diabetes (type one, though I would say for you to talk about this with your doctor first). Or, if you simply have a sensitivity to artificial sweeteners, as many people do, you won’t have to worry about any discomfort after taking this. The only downside to this gainer is pretty closely tied to what makes it one of the best (or so I think anyway). It doesn’t have any flavor. Or sweetener, for that matter. And even though this may not be much of an issue for some people it could certainly be a real deal breaker for others. You can still add fruits to the mixture when blending and maybe even a little yogurt for a flavor and a slight calorie boost. Unfortunately, that might mean having to prepare it beforehand or have access to a blender in order to make it after a workout or in between meals. You wouldn’t be able to just use your mixing bottle and have flavor. This may not even be an issue for some, as I know some of you will drink them so fast it doesn’t matter what it tastes like. 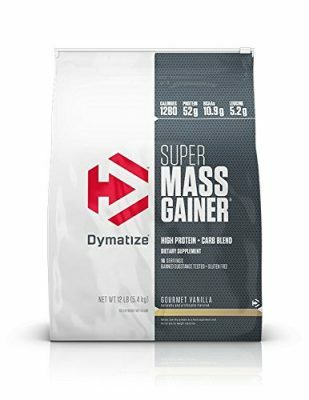 Dymatize Super Gainer is the official heavyweight of this list with a whopping 1,280 calorie count per serving. Additionally, it uses not one, not two, not even three, but four sources of protein. For those having difficulty gaining not only weight but muscle, this gainer will help you meet your calorie needs and you’ll know it isn’t the type of protein source that’s slowing you down. It is artificially flavored but also gluten-free for those with a sensitivity to wheat products, allowing even those with celiac disease to put on the pounds necessary for bodybuilding and muscle development. This gainer also contains the essential vitamins necessary for your body to operate at its peak. It has a great tasting vanilla flavor, but also boasts a selection of 5 others you can choose from in case you want a little variety. It comes in both 6 and 12lb bags, but I always go for the 12lb since it is more cost effective. The Dymatize Super Gainer includes an impressive selection of flavors. This is a major benefit for those wanting to keep a little variety in their lives. Drinking or eating the same things for months on end can get pretty old, but with these flavors you can change things up quite a bit and avoid getting overly bored with your diet. Simply order more than one flavor at a time and mix things up (figuratively or literally), or you can simply alternate between the flavors you order and try something new every time. Really, it’s just nice to have a few options. Another major advantage of this gainer is that it is gluten free, which is ideal for anyone suffering from celiac disease. This particular sensitivity can make it extremely difficult to find a gainer, as your body needs carbs for energy so that it can use protein for muscle growth. Not a great fit for anyone with lactose intolerance or a dairy sensitivity. Since this gainer uses both egg proteins and milk proteins it could be a bad combination for anyone sensitive to dairy. In my opinion its always better to have a variety of protein sources in your gainer. Unfortunately, not everyone has the luxury of being able to digest them all. They also don’t explicitly list the source of the carbs, other than maltodextrin. It’s great that it is gluten-free, but it would be nice to know where the carbs are coming from. Good as a Pre or Post Workout Drink: This protein powder contains creatine and L-Glutamine, which is a key amino acid that aids in muscle repair. This, combined with its nutrient dense composition make it perfect as either a pre or post workout supplement. You can use it as a pre workout to get a boost of energy and help you push yourself harder, or use it as a post workout to help your muscles recover rapidly. No matter when you choose to take it, you’re getting a big caloric boost and nutrition boost. Premium Protein Blend: Instead of loading up on one type of protein, Cyto Gainer contains partially pre-digested whey peptides, whey protein concentrates, and milk protein concentrate. This blend of protein is specially designed to be easily absorbed and digested by your body, while also promoting lean muscle growth. This protein blend is another source of sustainable fuel, along with the carbohydrates, and provides both fast and slow digesting proteins, for both short and long term gains. 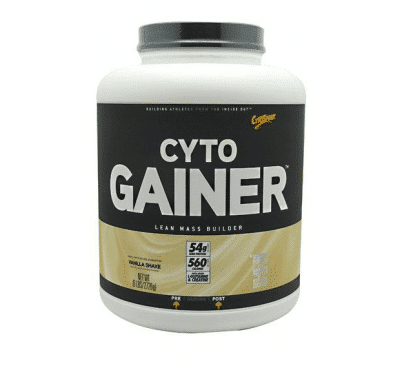 If you’re tired of being scrawny and you’re looking for something to help you pack on some pounds and kick-start muscle growth, you’re looking for CytoSport Cyto Gainer Protein Powder. Unfortunately, if you have milk or soy allergies, you’ll have to skip over this powder because it’s made from products derived from milk and soy. However, if you aren’t allergic to milk or soy, there’s little downside here. Cyto Gainer has been around for over a decade and is a favorite of many bodybuilders, young and old. Let’s be clear; we aren’t saying you have to choose one over the other. Many bodybuilders use both simultaneously. However, it is important that you know what each one brings to the table before you start your regiment. Both of them work together with a healthy diet to improve recovery time while building muscle and lowering your body fat percentage. Protein powder should be your first weapon in your arsenal for fighting for healthy muscle growth. Protein powders typically use whey proteins for its low-fat content and easy digestion. Using a protein powder is not only a fast and easy way to make sure you are meeting your protein needs, but it also usually cheaper and has less fat than eating whole foods to meet the same needs. Weight gainers pack the caloric punch you need to feed your body what it requires to build muscle. They usually contain low fat calories and supporting nutrients needed to put on the weight so your body can transform it into muscle. It is much easier than finding high-calorie low-fat foods with the right nutrients in your regular diet. There are some weight gainers that are two in one, with your calorie needs as well as the amount of protein you need to gain the weight and build your muscles. In case you already have a background in supplements, then the proper use of a mass gainer won’t be much of a hassle for you. The very first thing to note is that it’s usually recommended to mix the powder with milk instead of water. The rationale behind this is that using water would mean you’ll be consuming 120 calories less and roughly 8 grams less of protein. For making your shake, mix the powder and milk. It is advisable to use a blender, especially if you notice lumps in your drink, as it is preferable to have everything broken down finely to facilitate proper absorption. The amount of powder depends on your nutritional target, but in general, 1 to 2 scoops will suffice. This will help you gain between 2 to 4 pounds a week if you take your supplement diligently and combine it with proper workouts. Remember that muscle building reaches its peak 30 minutes after your workout, so this would be the best time to take your supplement. It does not mean, however, that taking it at other times will be detrimental or anything, it’s just that it’ll be ideal. Here are some tips to help you use mass gainers to the fullest and ensure you have the best one for your needs. Use fruit to make a smoothie: Some mass gainers some flavored, but those that don’t can be flavored naturally by blending them with fruit. Just throw some strawberries or bananas in with your gainer and you have a great post-workout meal. You can do this even if your gainer comes flavored. Don’t forget your off days: Though you may not be hitting the gym today, your body is still working hard behind the scene and building muscles. It still needs energy and the extra calories and protein to build the lean muscles you want, so don’t forget to take your gainer on your off days. Which protein works best for you? : This one may take some time to figure out, but it is important to find out which protein source works best for your body to break down quickly. Make sure to keep an eye out for the sources on your gainers and even ask your doctor which one might be best for your metabolism. Mass gainers can help you achieve your fitness goals quickly, but they’re not without drawbacks. It would be wise to consult a medical professional before you start using any supplements. Bad Taste: Unfortunately, the vast majority of mass gainers don’t taste good. Some people have a tough time taking these supplements because of their cringe-worthy taste. Moreover, many come with a bad aftertaste that lingers for while after you swallow the mixture. Insomnia and Dehydration: Many mass gainers combine caffeine and creatine so you can have more intense workouts. However, regular intake of caffeine can be troublesome. Although its energy boosting effects can be beneficial for workouts, caffeine itself can cause anxiety, restlessness, and insomnia, especially if taken close to bedtime. In addition, researchers found out that supplements that use the combination of caffeine and creatine increase the risk of dehydration. Gastrointestinal Discomfort: Using certain mass gainers can cause gastrointestinal problems. Again, creatine appears to be the culprit, as it has been shown to induce diarrhea and upset stomach. Moreover, if you’re lactose-intolerant, there is an increased likelihood that you will experience bloating, cramps and nausea from consuming dairy-based protein products like whey. Unhealthy Weight Gain: When you are aiming to build muscle, you must infuse more calories into your diet. In order to promote weight gain, a high-calorie diet should provide 2,200-3,200 calories per day, depending on your age and gender. If you are having a tough time meeting such calorie needs, a mass gainer can help. However, if you don’t need as many calories and you start taking a high-calorie supplement, you may gain fat instead of muscle. Note that getting too many calories from any source — even from a muscle builder – can lead to fat gain. Mass gainers can be very beneficial if you wish to build and develop your muscles. However, there are some disadvantages associated with these supplements. You must know the pros and cons so you can have an easier time figuring out whether or not you should start taking one of these products on a regular basis. Consult with your physician to discuss the use of mass gainer supplements before adding them to your diet. Ultimately, I would have to say my favorite mass gainer is the NAKED MASS All Natural Gainer, as it has the calorie count necessary for gaining mass as well as a gluten-free carbohydrate source, low risk of sensitivity to the protein used, and no artificial sweeteners or flavors. 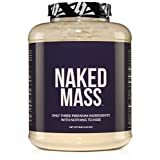 Though it may lack a bit in the taste department, I believe the NAKED MASS natural gainer to be the healthiest choice on this list. The aforementioned is also available at a great price!